Murrieta, CA - Come celebrate the holidays while riding orange with KTM staff and enthusiasts. 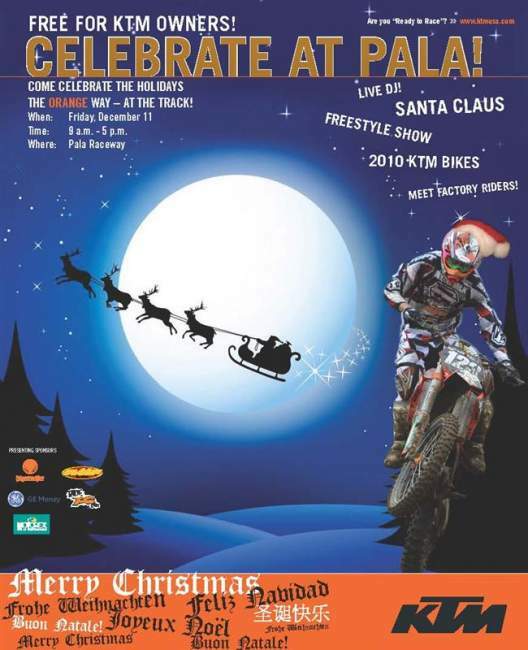 KTM North America, Inc. would like to extend a Christmas invitation to all KTM riders to come and ride at Pala Raceway on Friday, December 11, 2009 from 9:00am – 5:00pm absolutely FREE. Each year, the KTM west office holds an internal Christmas party exclusively for KTM staff. This year, in spirit of the holiday season, KTM President, Jon-Erik Burleson, along with the promoters of Pala raceway and presenting sponsors Jagermeister, FMF, Powersport Grafx, Motorex, Thor and GE Money have decided to open the invitation to all KTM riders for FREE! KTM dealers and presenting sponsors will be on hand to show their new product and give you great gift ideas for your family and friends this holiday season. KTM riders Tommy Searle, Ronnie Renner, David Kamo, Nate Kanney, Cory Buttrick, Mike Brown, Kurt Caselli, Russell Bobbitt, Kasey Martinez, Brenden Ritzman and Michael Sleeter will be present to turn laps before the start of their 2010 racing season. Renner and some of his very talented freestyle friends will put on an afternoon freestyle exhibition. In addition, Jagermeister will bring a live DJ to blast rockin’ music through the pits all day. To top it off, Santa Claus will be on hand to take pictures with riders young and old before the Christmas holiday.